We are pleased to present the latest drawings by Richard Serra at the Galerie m Bochum. By contrast with the drawing series Rounds, exhibited at the gallery in 1996, in the drawings from the past two years now on display Serra works not with weight, mass and density, but rather with powerful dynamics, speed and openness. The circular lines remain visible as individual overlapping or juxtaposed parts of an open circular structure whose centre always remains empty. The swift movements of the hand and the force of the whole body that goes into drawing can be felt in the finished work. At the same time, some of the works are marked by a lightness and fineness that belies this force. The method by which Serra creates his drawings is interesting and quite unusual: he first applies a layer of a paintstick onto the floor, lays a fine-meshed screen over this and then covers it with a large piece of handmade paper. On the reverse side of the paper he now begins the drawing process with a stylus, without being able to see the actual results, thus drawing in a kind of absolute abstraction. This method of drawing in abstraction and using the entire body demands an enormous psychological and physical intensity on the part of the artist, and absolute presence. Serra's drawings evolve as part of his constant, intensive interrogation of his own sculptural work. While he continually develops the concept of the sculptures in an ongoing process, he attempts to capture their quality again and again from fresh perspectives with his drawings series. 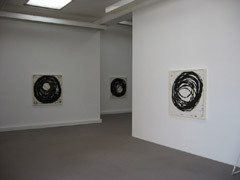 But the drawings do not merely constitute a depiction of the sculpture or an illustration of space. The spatial effect the viewer perceives when looking at the drawings emerges instead from the way in which our eyes follow the circular line drawn across the paper. Serra's drawings not only take up a fruitful dialogue with his sculptures, but also lay claim to a completely independent significance and standing in his artistic repertoire.